British teaching assistant and model Harnaam Kaur, 24 is now a world record holder—she is the youngest woman in the world to sport a full beard, according to the Guinness World Records. Harnaam has polycystic ovary syndrome (PCOS), a hormonal condition that can cause excess facial hair. The condition made her a target for bullying throughout her teenage years. 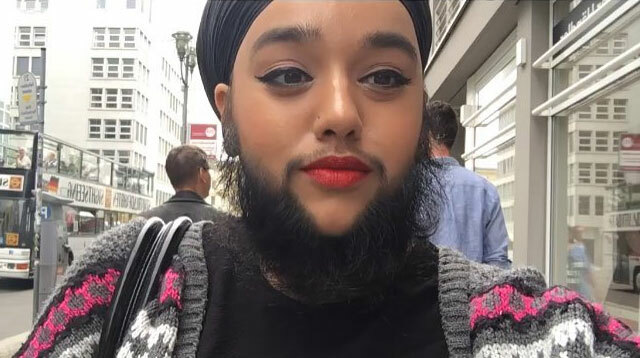 According to an interview with BBC News, Harnaam resorted to waxing her beard twice a week in her early teens, as well as bleaching and shaving. It wasn't until being baptized as a Sikh at 16 that she began to grow out her facial hair. The practice of growing one's hair out, or Kesh, is one of the five central tenets of the Sikh faith. According to Sikhism, Kesh is about respecting for the perfection of God's creation — if God didn't want you to have hair, you wouldn't have it, basically. This is not the first time Harnaam has made headlines either; in March she become the first female with a beard to walk the runway at London Fashion Week during Los Angeles-based jewelry designer Marianna Harutunian's show.